This cowl will call you to linger a while a longer. Designed to use up left over bits, or specially purchased tiny skeins, the magic it creates in the endless color combinations, mixed with the texture of the stitches will dare you to not put it down until the last stitch is complete. Will you linger? 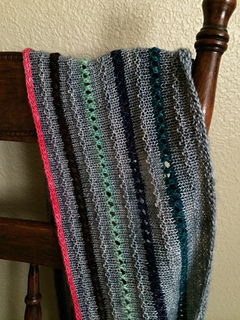 Skills Used: Long tail cast-on, knit & purl stitch, increasing & decreasing, i-cord bind off. Finished Dimensions: 60” circumference, 7” wide.